I met Pam and Samantha, an Australian mother and daughter who had travelled all the way from Perth, with a suitcase loaded full of toys, books and puzzles to hand out to children. "I usually just give them out on the street," said Samantha, a veteran visitor to the island. "This time Mum suggested we do it properly at an orphanage, so we looked online for somewhere to visit. "We just wanted to give something back. They're such beautiful people, aren't they?" They donated to the Jodie O'Shea orphanage, an apparently well-run institution in Bali's capital, Denpasar. Its founder, British-born Alison Chester, set up the orphanage to house children from another home which she says was abusing and exploiting them for profit. With one and a half million tourists visiting the Indonesian island every year, only a small proportion need to visit an orphanage - and make a donation - to generate an income for the owner. "The tourism is not organised. Many tourists will just climb into taxis and ask to be taken to an orphanage," says Alison Chester. "Often the taxi drivers have been paid by an [orphanage] owner to bring the tourists in. What they see on the outside is not necessarily what's going on the inside." When I visited the House of Hope orphanage, home to 95 children, I was taken for just another foreigner looking for a taste of the "real" Bali. The owner quickly made an appeal for money, suggesting a donation of $50 (£32). When I asked about bank transfer arrangements to send money from abroad, she suggested I pay the money directly into her personal bank account, saying this reduced bureaucracy. 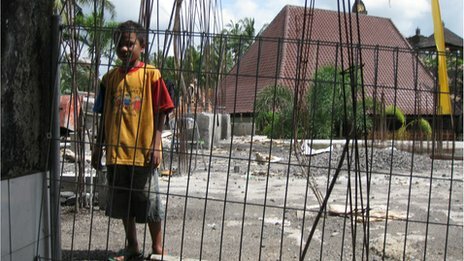 Fifty kilometres to the east of Denpasar, I visited the Dharma Jati children's home in the village of Klungkung. The site is dominated by an imposing temple, which is still being built - with children barely in their teens among the labourers. "My children work here, yes," the administrator confirmed to me. "They are happy working here." Those on the site were reluctant to speak with the supervisor around, but one young man said the children worked eight or nine hours every day. "We come here for school, but the school is only in the evening when we are usually too tired to study," he said. "The younger children have to go out on the streets to perform." The owner of the orphanage, Wayan Nika - who has received government awards for his contribution to child welfare - seemed surprised when I put it to him that some people would describe this as forced child labour. He said the home provided "work experience for children" - and added that the temple would contribute to spiritual harmony, making the world a better place. The majority of the children are not in fact orphans but their parents are simply too poor to care for them. Some orphanage owners run enticing recruitment campaigns in the villages to lure the children away. "The children are a commodity to many directors," said Brenton Whitaker, an Australian who runs Bali Kids, a local healthcare charity which deals with many of the orphanages. "The orphanages get an allowance from the government for each child, but they get most of their revenue from the tourists who visit. "In the worst cases, it's just like the mafia. You find orphanage directors driving large cars and sending their children to expensive universities in Europe or America, while the children live in squalor." Mr Whitaker says that in his view the majority of Bali's orphanages are badly mismanaged, with a few of them criminally so. In total I uncovered claims of abuse in four specific orphanages with reports of extortion or profiteering in several others. I heard detailed reports of abuse from parents, former orphans, NGO workers, concerned foreign visitors, local journalists and even some reports from concerned orphanage owners themselves. But when I reported some of the allegations that I had uncovered in just one week to the government's Social Welfare department, its director told me he had not heard such claims, though he did promise to investigate. For tourists, there remains a dilemma - how to help needy children without having their money being diverted or encouraging exploitation. Alison Chester of the Jodie O'Shea orphanage wants visitors to be vigilant, but still generous. "Just don't hand over cheques to organisations unless it's in the charity's name, unless they are willing to show you their books," she said. "But don't give up on us. The children here need help."